It’s that time again. Your strategic plan is approaching its sell-by date, and it’s time to develop your organization’s new long-term goals. Where do you start? An effective community needs assessment provides a framework for the organization to define its strategic organizational goals according to the needs of its community and helps position it to react to changing trends in the future. Today’s nonprofit organization is subject to high levels of scrutiny from its constituent groups pertaining to its budget, allocation of resources, and response to the needs of the population it serves. As the strategic planning process begins, it is vital to be in tune with the thoughts of all of these groups—board members, clients, and community partners. The community needs assessment should be designed to provide responses to the following questions: 1) Who uses the organization, and how do they use it? 2) Are the demographics of the population the organization serves changing, and if so, how? and 3) To what extent are existing programs offered by the organization meeting the needs of the community? Answers to these questions will influence new priorities of the organization, and consequently, new goals for its strategic plan. Here’s a turn-by-turn guide to help you get started on this journey. Long-range planning should not cover as long a time period as you might think. 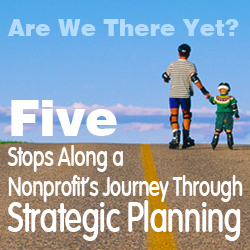 As the nonprofit environment continues to change, it is important to have a strategic plan that is dynamic. Consequently, strategic plans created now should cover a shorter time period than they may have in the past. Who knew ten years ago what the economic climate of nonprofits would look like today? With the ubiquity of social media, even the ways we reach clients and fundraise has changed drastically during the past five years. Similarly, we don’t know what technological advances nonprofits may be utilizing five years from now. Your document should be broad enough to chart a course for the future while allowing adaptability for new and exciting changes to the nonprofit field. In addition to clients and other community members, your board of directors provides critical input to the strategic planning process. Conducting a strategic planning brainstorming session or SWOT (Strengths, Weaknesses, Opportunities, and Threats) analysis with board members will energize them and bring up new ideas and direction regarding where they see the organization heading. The organization’s board, in conjunction with the executive director, should guide the vision of the organization, which should inform new short-term and long-range goals. Input from organization stakeholders is essential not only to identifying the needs of the community, but also ensuring the organization’s success in progressing toward its new long-term goals. A community needs assessment gives your organization an opportunity to learn more about the communities it serves, gather input from individuals invested in the success of the organization, and be better prepared to react to changing trends in the industry based upon identified community needs. A community needs assessment should incorporate different segments of the population that your organization serves. Clients, representatives from private industry, government officials, and leaders from other nonprofit organizations all have important feedback that can be valuable to a nonprofit organization. Input can be collected through surveys, interviews, focus groups, or a combination of these methods. Hearing what these constituencies desire in your organization’s services will help your planning committee hone its long-range goals to those that will most benefit the community. Ensure that your strategic planning journey is a success. Make sure the goals in your strategic plan are not only achievable but also measurable. This doesn’t necessarily mean your long-range goals need to be quantifiable. The ability to ascertain whether a goal has been met will continue to move the organization forward and keep its services relevant to its community. Creating a strategic plan simply because you think you need to have one will not lead to smart decision-making for your organization. The most thoughtful, forward-thinking strategic plan will be worthless if it sits on a shelf in a closet for the next three years. Strategic plans should be living, breathing documents. Relate to the prescribed goals when discussing new programming. Refer back to the strategic plan regularly and evaluate your progress. Make sure your board members know what goals the organization is striving to achieve. Your strategic plan should guide decision-making and position your organization to be able to tackle changing trends in the future. Do you have any success stories or questions related to your organization’s strategic planning process? Examples of how community members have helped a nonprofit organization shape its goals, or new ways to reach out and listen to your community? I’d love to hear from you! Email me at sarah@turkscap.com. Sarah Keister Armstrong is the owner of Turks Cap Consulting, LLC, a firm focused on helping nonprofit organizations and libraries best serve their communities. She is experienced in using qualitative and quantitative measures to evaluate public policies and programs, and has worked with government agencies, nonprofit organizations, and libraries. Sarah lives in the Chicago area and holds a Master of Public Policy and Administration degree from the University of Massachusetts and a Bachelor of Arts degree in Political Science and Sociology from Illinois Wesleyan University.